At Skyward Interactive, we’re always glad when one of our clients reaches a milestone and today we’re proud to announce that one of our clients, Jamcloud, has gone public beta. Jamcloud asked us to help them with user interaction and design for an app that would allow users to enjoy and share music with friends. It’s been a long time to wait, but we are excited to see the product get into users hands. 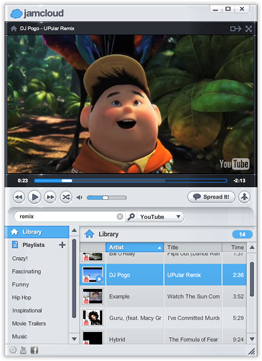 JamCloud is a free social music app that lets you play music and watch videos with your friends in real time. Create listening rooms with an international audience where you can chat about what’s playing and vote up or down. With a library of over 325 million songs and videos, JamCloud’s awesome music discovery tools make it easy to find what’s hot. Jamcloud - Spread the web! Jamcloud is a “Public” beta, but you will still have to sign up before you can download, and Jamcloud is only adding users every so often. The sooner you sign up, the more likely you will be to get a chance to use the app. For more detail on Jamcloud, the Jamcloud music player and to add yourself to the public beta list, visit http://www.jamcloud.com right now! This entry was posted on Saturday, August 11th, 2012 at 8:38 am Both comments and pings are currently closed.